If you are Dutch and my age and a regular visitor of movie theatres, the name Cloeck en Moedigh will need no explanation. But for the rest of the world: Cloeck en Moedigh is a company that has been making advertisements for movie theatres since the fifties. No videos, but photo’s with some spoken word. The ads were for local businesses, and varied from theatre to theatre. This way of advertising in Dutch movie theatres may have been state of the art in the 50’s, but somehow it never changed. While the rest of the ads changed into expensive hi-tec computer productions, Cloeck en Moedigh kept on producing these archaic, static 50’s ads. I kind of liked them, because they always made me feel I was time travelling. 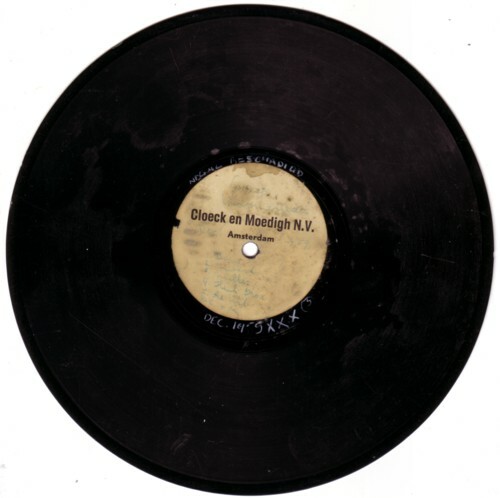 A few years ago somebody offered me five 10 inch 78rpm records for sale, with on the labels the name Cloeck en Moedigh. The records were more white than black, because of the fungi that grew on them, so I asked what was on these records. The guy who sold the records had no idea. Because advertisement records have my interest, I wanted to buy the records, but the prices were ridiculous, and I told him so. He said: “Take it or leave it.” So I paid a ridiculous amount of money and spend half an hour trying to remove the layer of white agriculture from the records. The result is not bad: you can hear what is on most of the records, but the sound quality is far from good. And, unless you have my interest in Dutch advertisement records, the content is totally uninteresting. The records are from 1958 and 1959; in those days the audio to the ads came from 78rpm records, that a technician had to start at the right time when the dia’s were projected on the screen. On each side are about 5 or 6 advertisement texts for local shops or companies. Hair dressers, fashion shops, bakeries, etcetera. No gimmicks, no jokes, no slogans, just a short description of the company and the mentioning of the address. Nice article. Would have been nice of the discs started with the sound of a walking horse, like that beautiful animated logo of they used. Did you know Cloeck & Moedigh was renamed from Calff & Mesch? During the occupation in WWII the Germans ordered for all Jewish company names to disappear. Only the C and M remained.